Provident Kenworth: The world-class living is here for you in Hyderabad! 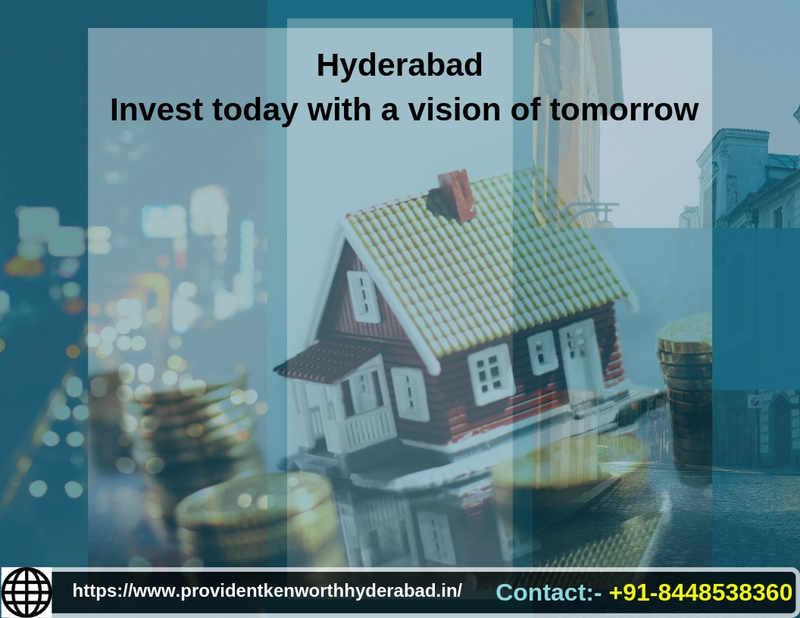 Kenworth by Provident Housing Limited is a new township project coming in Rajendra Nagar, Hyderabad. The project is coming with a wonderful mix land concept where work, play, and entertainment come together in an energetic way. The project is designed with a purpose to bring world-class living to all kinds of people. 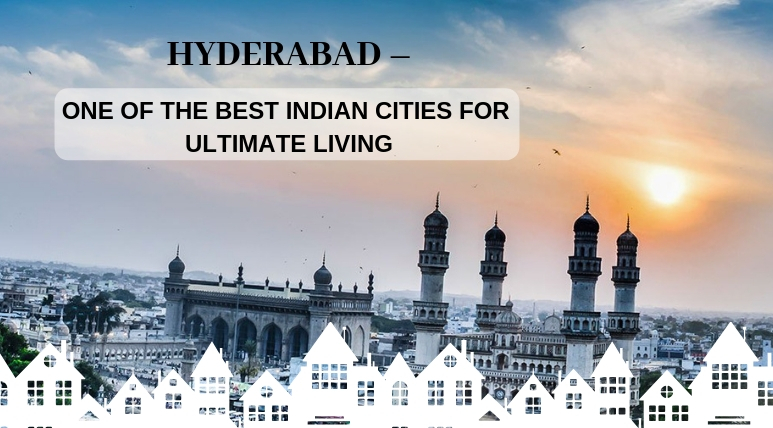 The city of Hyderabad is witnessing this revolution that allows people to relax precious time wasted in travelling as all the things they need come ready within their doorstep’s reach. This is great for starting a business as well since one can run their enterprise from the same campus as one lives in. The project comes alive as Provident Kenworth. It is a healthy mix of cafes, boutiques, homes and office spaces all within one secure boundary and campus. The project is located in Rajendra Nagar and is as much as an arts centre as it is a vibrant sports complex. Homes here are in beautiful configurations of 1,2 & 3 BHK style that are the epitome of space and comfort. These homes have been intelligently designed with no common walls for complete privacy. They are 100% Vaastu-compliant for maximum energy flow. Exclusive homes have the goodness and scientifically advantageous orientation of East-West facing entry. Provident Kenworth Price is quite affordable and backed by a number of payment plans. The price for these beautiful Studio & apartments starts at Rs. 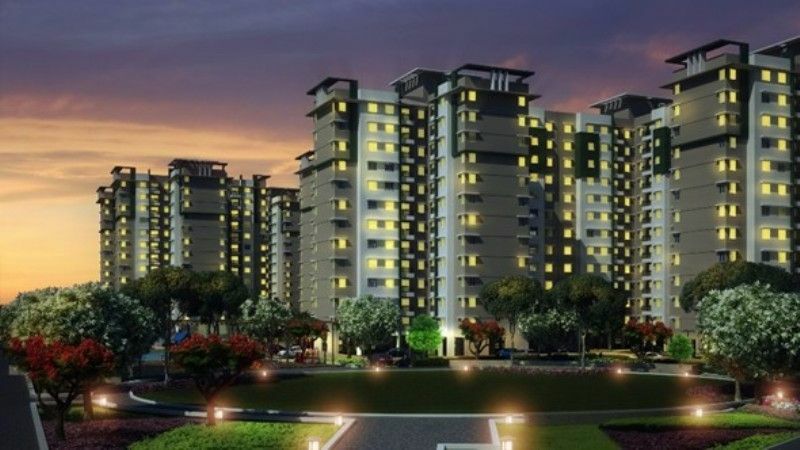 25.00* lakhs and slowly increases according to the apartment size and configuration. The project is in the pre-launch stage and a few units have left. It is advisable to book an apartment now, as the price of property will cost more when the project develops more and more. What are you waiting now? Get ready to live in the vibrant spaces that are simply safe, serene and picturesque. Live in the vibrant spaces that are safe, serene and picturesque. This is the promise of Provident Kenworth Hyderabad, the promise of an aristocratic life for its inhabitants in the coming times indeed! The project located at Rajendra Nagar that is strategically connected to the Outer Ring Road at APRA junction in Hyderabad. This location enjoys easy connectivity through the strong road and rail network. The area also comes in the close proximity to the Rajiv Gandhi International Airport and Cyber Towers. Many international schools and reputed technical institutes are also situated nearby. Beautiful Chikur Forest and Nehru Zoological Park is also located nearby and attracts a huge number of visitors from different areas. Glittering waters of Osman Sagar Lake and Himayat Sagar also offers a visual treat to eyes that will simply enthral you. The transport facility is easily available from this location. 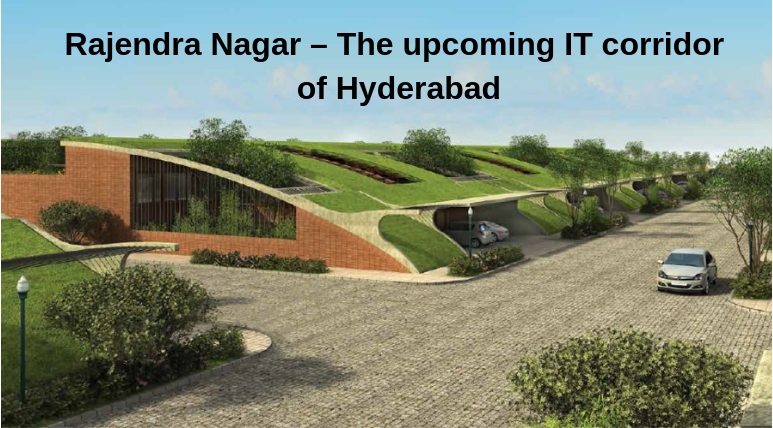 Hyderabad–From being the ‘City of Pearl’ to becoming the ‘Genome Valley’. After the formation of Telangana from Andhra Pradesh, the city of Hyderabad became the joint capital of the two states, an intermediate arrangement planned to culmination by 2025. Located along the banks of Musi river much of the city is situated on the hilly terrain around artificial lakes, including Hussain Sagar. The city is known for its pearl and diamond trade. Major Indian manufacturing, research, and financial institutions are housed in the city. Telegu and Urdu are predominant languages in the city. The city has a concoction of several heritage buildings and contemporary global buildings. It is ranked as the fifth most productive metro city of India. 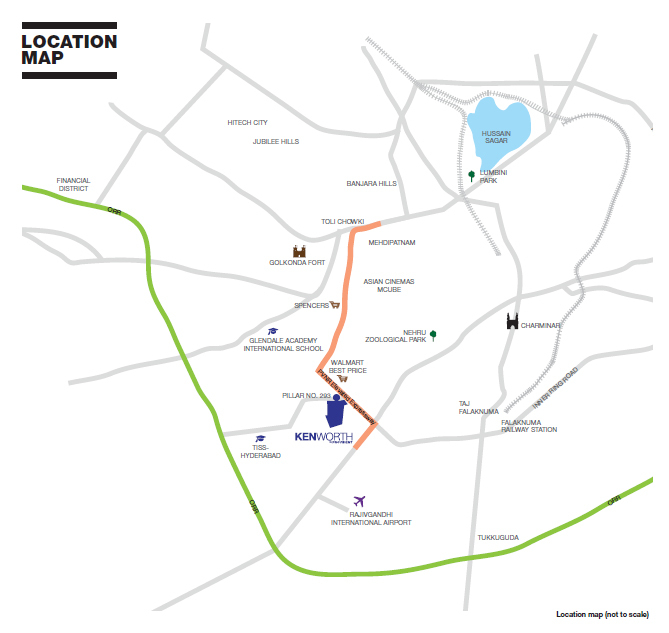 The Provident Kenworth Location Map at PVNR Expressway, Rajendra Nagar, Hyderabad. Provident Housing is a 100% subsidiary of Purvankara Group that is delivering quality homes to the homebuyers and investors across South India. The developer is offering affordable housing projects with world-class amenities. The builder is creating elite living spaces at splendid locations with super-luxurious features at affordable prices. Armed with a dynamic team of experienced professionals and skilled workers, the group is steadily climbing up the ladder of success in the real estate sector. Transparency in business operations, customer-centricity, robust engineering, and uncompromising values has placed the group among the most-preferred real-estate brands in both commercial and residential segments. Apartments with no common walls. Theme based project with well-lit landscape garden, Recreation Facilities, Club House etc. Swimming pool with associated change rooms, Health Facilities, Children Play Area, Jogging Track, Steam & Sauna, other indoor and outdoor sport facilities etc. The largest and the only gated community in that area with good connectivity towards - Airport, ORR, Bengaluru Highway. Located at PVNR Expressway, Rajendranagar, Hyderabad. Located close to Hardware park’s and Adibatla SEZ’s (TCS & CTS) within 25km. Get connected through inner ring roads with in 20 mins. International schools, Shopping Malls within 15 mins drive. Located close to entertaining hubs like Snow world, Jalavihar within 20 km distance.